Besides the owner of the business, any Yandex user can send a request to change business information. 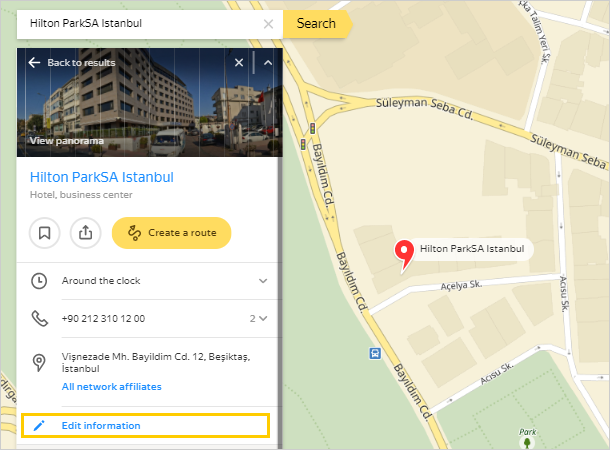 Find the business in Yandex.Maps, go to the business profile, and click the Edit link. Correct the information in the window that opens and click Send. If you are the owner of the business, follow the link in the same window to go to the Yandex Business Directory and correct information in the Yandex Business Directory interface. You can see your edits in the business profile immediately. The changes are shown only to you until your edits have been checked. During this time, you will see the following message in the organization's card “Thank you for updating information about this organization. Your submission is currently visible to you, and will be visible to other users after it passes moderation ” . If the edits are in line with our rules and requirements for providing information, they will become available to everyone after verification. Request processing takes about three days. In Yandex.Maps, information is updated within about three days after verification. The address snippet in search results will be updated within a week. The owner of the business can change business information in the Yandex Business Directory interface. On the My businesses page, click the business name. On the business page, go to the Information section, enter new data, and click Save. If you want to change the category or edit additional details that were entered previously (for example, the average bill, free Wi-Fi, or card payment), go to the Services section. You can also add or remove a photo. Your changes will be checked and updated on Yandex.Maps soon.